I enjoy playing along with Splitcoast Stampers' Featured Stamper Challenge (every Sunday). You get to browse the galleries of some fabulous stampers and C.A.S.E. (copy and share everything) your favorite card (or two, or three). You are challenged to make a few changes and then share with the rest of the SCS community. Mine pales in comparison to Julie's but I don't have the supplies that Julie uses on her card. I've simply made due with what I have. I do LOVE the way it turned out though. The color of the card is what drew my attention to it so I kept the colors and the layout. I just flipped it 90 degrees. I left off the ribbon, added brads, changed the sentiment and embossed the flourish behind my punched flowers using black embossing powder. The sentiment panel is mounted on dimensionals. It's hard to see in the photo, but the large white panel is textured with the Big Shot large dots Texturz plate. Thanks for stopping by today. 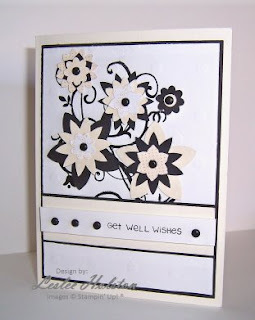 I hope you've been inspired to give the Featured Stamper Challenge a try.